(Nanowerk News) An international team of scientists using the NASA/ESA Hubble Space Telescope has combined images taken with the Wide Field Camera 3 with the unprecedented ultraviolet spatial resolution of the Space Telescope Imaging Spectrograph to successfully dissect the young star cluster R136 in the ultraviolet for the first time . "Once again, our work demonstrates that, despite being in orbit forover 25 years, there are some areas of science for which Hubble is still uniquely capable," concludes Crowther. 1] R136 was originally listed in a catalogue of the brightest stars in the Magellanic Clouds compiled at the Radcliffe Observatory in South Africa. It was separated into three components a, b, c at the European Southern Observatory , with R136a subsequently resolved into a group of eight stars (a1-a8) at ESO, and confirmed as a dense star cluster with the NASA/ESA Hubble Space Telescope after the first servicing mission in 1993. STIS's capabilities were restored in 2009 by astronauts who successfully completed Serving Mission 4, one of the Hubble's most challenging and intense servicing missions, involving five spacewalks. The ultraviolet signatures of even more very massive stars have also been revealed in other clusters -- examples include star clusters inthe dwarf galaxies NGC 3125 and NGC 5253 . 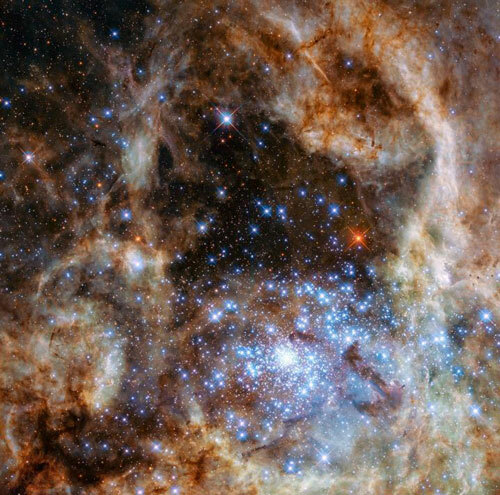 However, these clusters are too distant for individual stars to be distinguished even with Hubble.